The Yulia who wants to kill Russians! KIEV, January 22. /TASS/. Ukraine’s Batkivshchina (or Fatherland) party has nominated its leader, former prime minister Yulia Timoshenko to run for president. The decision was made at a party congress on Tuesday.Timoshenko’s electoral program emphasizes the need for a new economic policy. She said earlier that more than 100 experts had been working on a new policy for three years. “This is the country’s intellectual resource that can give us a chance, and we, politicians, will implement it provision after provision. This is a path towards success and revival,” she claimed.The Ukrainian presidential election is scheduled to take place on March 31.According to recent opinion polls, Timoshenko leads the race as 19.3% of Ukrainians are ready to vote for her. Comedian Vladimir Zelensky comes second (12.9%), while founder of the “Opposition Platform For Life” group Yuri Boiko is third (11.6%). Incumbent President Pyotr Poroshenko comes fourth (11.3%), followed by former defense minister, leader of the Civil Position party Anatoly Gritsenko. 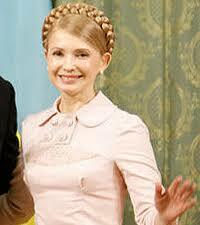 Is she gonna be the next Ukraine President?